Drag and Drop Search is a free Chrome extension that offers an elegant solution to a common problem: Searching on the website that will give you the answers you need. Google is a great engine, but there is no reason to go through it for everything. If you're after quick facts and figures, you might be better off searching Wikipedia directly; if it's videos you're after, then a direct YouTube search might let you find them faster. If you'd like to get a sense for a place, searching for it on Flickr will show you what it's like. With Drag and Drop Search installed, you only need to select a term, then drag and drop it on the name of the search engine you'd like to use. The Drag and Drop Search configuration interface looks like it was lifted out of a 1997-era webpage, and requires prior knowledge to work. Drag and Drop Search works by overlaying your window with a four-by-four grid. By default, the center of the grid is clear, and the cells for the outer perimeter are each assigned to a different website or search engine. This makes for twelve sites and engines the add-on ships with, including Delicious, Twitter, Wikipedia, and other popular websites. It's easy to get started: Select any word or term on the current page, start dragging, and the grid will appear. Each of the cells is clearly labeled; drop the term on the cell for the site you want to search and it will open up in a background tab. If you are looking for visual polish, you won't find much of it in Drag and Drop Search. The extension does have a configuration pane for customizing your engines, but it is very bare-bones. It's just a basic HTML table with one table cell for each grid cell. There are no instructions for customizing the search engines used. Each engine has a name, and a URL. Search engine URLs often contain many arguments, one of which is your search term. Drag and Drop Search does not provide a wildcard character for substituting your search term (like %s on Chrome). Instead, you are supposed to format the URL so that the search term is the last parameter, and leave it blank. 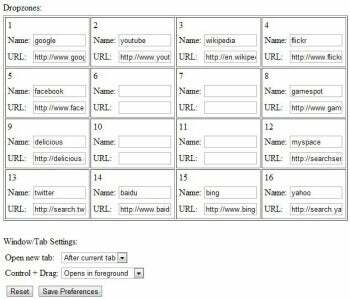 In other words, you need to be fairly familiar with URLs to customize the search engines Drag and Drop Search uses. In action, Drag and Drop Search offers a beautiful and effective way to search specific websites for a string of text. The basic mechanism Drag and Drop Search uses is brilliant. It is easy and fast to grab a term and drag it to the right search engine, and it's even a gesture that translates well into a touch interface (unlike right-clicking). I see Drag and Drop Search as a proof of concept, and a sign of things to come. 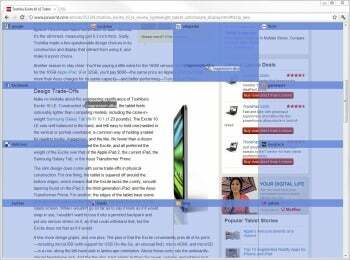 But even in its current state, it is a simple and useful Chrome extension. Note: The Download button takes you to the Chrome Web Store, where you can download it directly into your Chrome browser. Chrome extension Drag and Drop Search lets you quickly select text and search for it in specific search engines just by dragging and dropping.